Calling all Cooks! 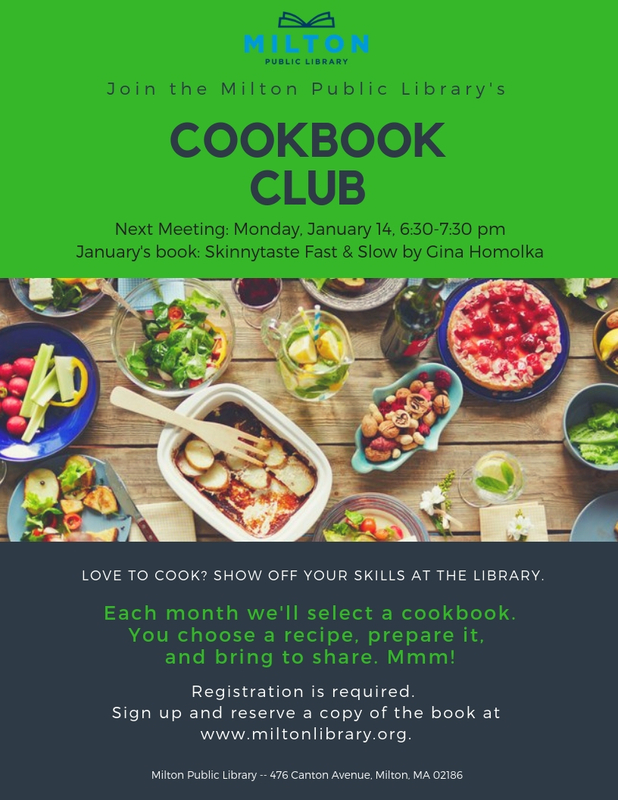 The Milton Public Library Cookbook Club, led by local chef Connie Spiros and Assistant Director Sara Truog, invites you to its next session on Monday, January 14 from 6:30-7:30pm. Each club meeting will feature a selected cookbook, and members will prepare a tasty treat from the book to bring to the Library and share. The cookbook chosen for January is Skinnytaste Fast and Slow by Gina Homolka. Please register through the library events calendar. Only registered cooks will be able to attend. Once you've chosen your recipe, contact Sara by email (struog@ocln.org) or phone (617-898-4951) to let her know what recipe you’ll be trying so we don't have a lot of duplication in the dishes we'll sample on meeting night! Space is limited and advance registration is required. Registration will open on Monday, December 24. Once you register you will receive more details about the club. Bon Appetit!